This day in 2007 marked the first test of the strongest conventional (non-nuclear) bomb. The Russians wanted to use these bombs instead of their nuclear weapons, because they don’t emit harmful radiation. Russia tested the biggest non-nuclear bomb in world history on this day. Its nickname was “Father of all bombs”, an allusion to the famous U.S. bomb which had been known as the strongest bomb, nicknamed “Mother of All Bombs” (MOAB). In fact, this American bomb was actually named “MOAB”, which is the official abbreviation for “Massive Ordnance Air Blast bomb”. The “Father of all bombs” has the explosive power of about 44 tons of TNT – four times stronger than the U.S. MOAB. The bomb is officially named: “Aviation vacuum bomb of increased power” (Russian: Aviacionnaâ Vacuum Bomb povyšennoj power). It weighs about 7,100 pounds, and works on a vacuum (thermobaric) principle, which produces stronger devastating impact than conventional explosions. Thermobaric weapons use oxygen from the air for combustion, and they are more destructive than the ordinary bombs which use oxygen contained in the explosive. The Russian bomb consists of explosive mixed with fine aluminum powder and ethylene oxide. 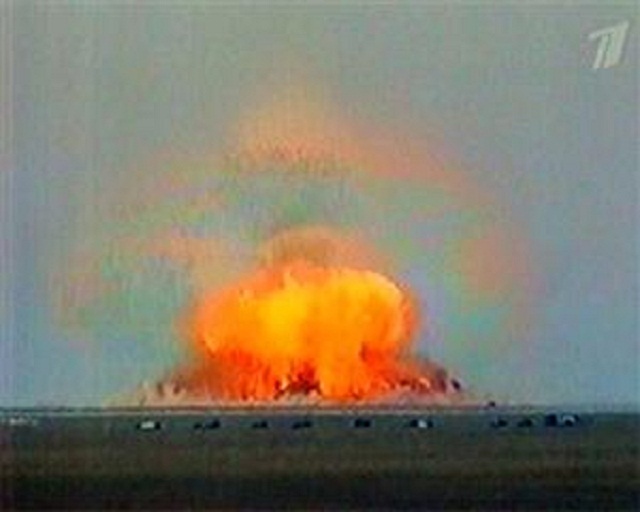 The range of the devastating impact reaches 300 meters from the center of the explosion. The Russians wanted to use these bombs instead of their nuclear weapons. Namely, the “Father of all bombs” has almost the same power as a small nuclear bomb, and doesn’t emit harmful radiation. The Russian Federation produced about 100 such bombs.